Also known as Lyme borreliosis, lyme disease is a type of infection which is contracted from a tick’s bite. The disease is from a strain of bacteria known as spirochete, which comes from the bite, and is commonly found in animals such as deer and mice. Physical manifestations such as skin rash, as well as the possibility of exposure to ticks are the first things to look out for; but to be perfectly sure, especially in the later parts of the disease, lab tests are necessary in order to detect and diagnose the condition. Most of the cases of this are seen along the Pacific coast, in the Northeast area of the United States and the upper Midwest region. This illness is a common occupational hazard to people who work outdoors and are usually in grassy areas since ticks are found in these conditions. Walking through grass and other activities involve spending a lot of time here, increasing the risk of contracting lyme disease, especially if your skin is exposed. Having pets such as cats and dogs can also increase the chances of getting this, since they can carry the ticks to your home. When you notice a tick on your skin, you have to remove this properly and as fast as possible in order to prevent the disease from spreading through your body. A circular rash which develops around the affected area. It usually appears one to two weeks after the initial bite. Inflammation of the knees, elbows, and other large joints. In some cases, people will also experience some heart problems like irregular heartbeats a few weeks after the initial infection has occurred. 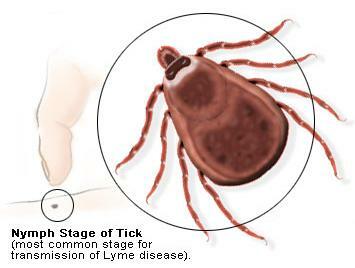 There are actually several ways to treat lyme disease. One of the most common ways to do it is through orally taken antibiotics, which would be prescribed by your doctor or physician. Samples of medication to be taken are amoxicillin and doxycycline. This is especially effective during the early stages of the disease, since it will still be weak and unable to withstand the medication. Most of the time, it would take two to four weeks of using the medication in order to completely remove the problem. However, in some cases wherein the patient has cardiac or neurological forms of illnesses, other types of drugs are to be used like penicillin or ceftriaxone. Still, the best cure to lyme disease is the same cure for all other diseases and illnesses: prevention. Avoid ticks and areas where ticks are common. Wear protection such as socks and denim pants when in grassy areas. Preventing it is always better than having to deal with it. Also, if you do get bitten by a tick, remove it properly and wash the affected area immediately.